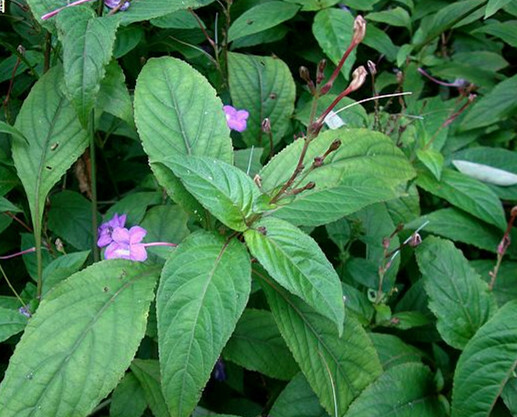 The drug is the dried or fresh rhizome or entire herb of Asystasiella chinensis (S. Moore) E. Hossain (family Acanthaceae), growing in moist shady sites under woods, near streams, and distributed in Jiangsu,Zhejiang, Jiangxi, Henan, Hubei, Hunan, Guangdong, Guangxi, Yunnan of China. Sweet, bland, neutral; lung meridian entered. It is used to remove toxic heat, remove blood stasis and stop bleeding; for the treatment of hematemesis, bloody stool, traumatic bleeding, sprain, furuncle, sore throat. Decoct 9~15g, or 30~60 g of the fresh, or pounded into juice for oral taking. Proper dosage is for external application, pounded for applying. It is contraindicated to pregnant women and women in menstrual period.